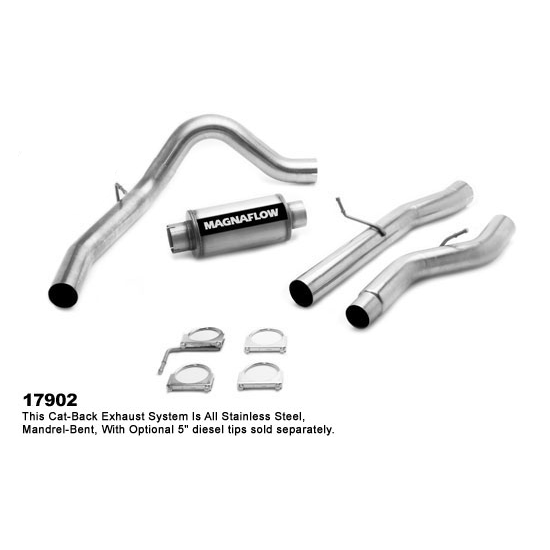 * No tip included Magnaflow Stainless Steel Turbo-back system for the 2001-2007 Chevrolet Silverado GMC Sierra 2500HD/3500HD Crew Cab/Short Bed with 6.6L Duramax Diesel engine features a mandrel bent 4" Turbo-back. This system is a single outlet system and does not include tip. Magnaflow Exhaust systems are the most popular exhaust systems on the market today. Magnaflow designs and builds each system to fit and sound perfectly for your vehicle, whether it be a car or truck, American made or foreign. Magnaflow exhaust systems are all built with high grade stainless steel components and feature stainless welds and clamps. Backed by a Lifetime Warranty. No one else gives you the bold clean styling of our Aftermarket Dress Ups, Suspension and Performance Parts for your American Muscle Car like UPR Products! Click Here for Instructions Fits these Vehicles: 2001 2002 2003 2004 2005 2006 2007 GMC Sierra Chevrolet Silverado 2500HD 3500HD 6.6L Duramax Diesel Crew Cab Short Bed.